-That without struggle against capitalism, a consistent fight against imperialism is not possible; since imperialism is the highest stage of the capitalist world system. We call all anti-imperialist forces to raise their efforts to topple the capitalist order which is in a deep and historical crisis. Socialism is the sole alternative against the capitalist system, and revolution is the only way to transform this system. “Another world” is socialism. -That the social liberation struggles and the national liberation struggles of the oppressed nations are parts of the same front against imperialism. Chauvinistic nationalism is not anti-imperialist, on the contrary it divides and clashes the peoples and in this way it serves imperialism. Imperialism cannot be advocate of any oppressed nation, what it pursues is only to be the new dominator of those oppressed nations. Anti-imperialist struggle should be waged with an internationalist perspective to unite the peoples and oppressed nations of the world and regions. -We declare our support for the national liberation struggles/resistances going on in Basque Country, Kurdistan, Palestine, Iraq, Afghanistan and all others oppressed nations; and the social uprisings, revolutionary processes, worker strikes, popular resistances, youth movements and mass mobilizations going on in Greece, Nepal, India, Turkey, Italy, Croatia, Latin America and other countries. We strongly condemn all the attacks against these movements and external meddling in the internal affairs of individual countries. 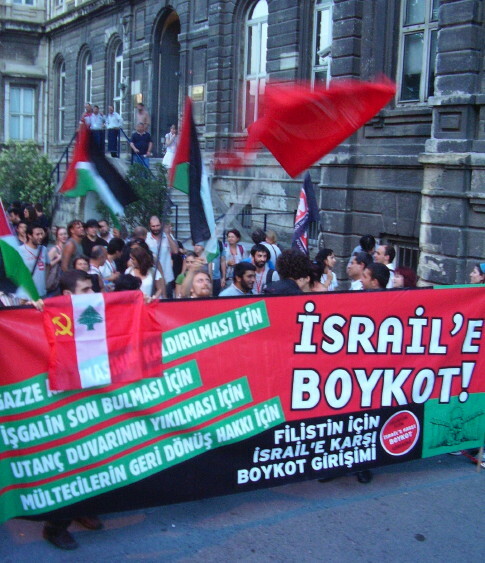 We condemn the Gaza Blockade of Israeli Zionism and call for the total boicott of the Israeli Racist State. We stress the vital importance of solidarity. -That imperialism means poverty, violence and war to the women. Women’s liberation struggle is a part of the anti-imperialist struggle, and without the active participation of women’s masses the anti-imperialist front will be weak. The patriarchal system is basing itself on gender inequality, and a new society without exploitation can only be possible with full gender equality. -The anti-imperialist unity can only be realised on a practical political basis. The peoples struggling against imperialism should come together. We call all progressive, democratic, patriotic and religious movements who fight against imperialism to form a broad anti-imperialist front. In a crucial moment of crisis of the imperialist-capitalist system, we call all the anti-imperialist forces to raise their efforts to develop revolutionary internationalist unity to fight imperialism internationally. -to decide a common day of action of the ESF to unite the labouring masses of Europe in such a deep moment of the crisis, to reject paying the bill of the capitalist crisis. -to practise international solidarity against the war policy of the Turkish government, handling the Kurdish question with military measures instead of discussing it with popular representatives; and solidarity with the Kurdish politicians and freedom struggle activists, who were imprisoned depending on the so called ‘Anti-Terror’ Law and will be brought to their first trial on the 18th of November in Diyarbakir.